You are here: Home / ColaLife Scale-up / Kit Yamoyo. Proudly Zambian. I’m just back from a support visit to Zambia. There will only be one more such visit, in Feb-18, before the scale-up projects (KYTS-ACE and KYTS-LUSAKA) come to an end. 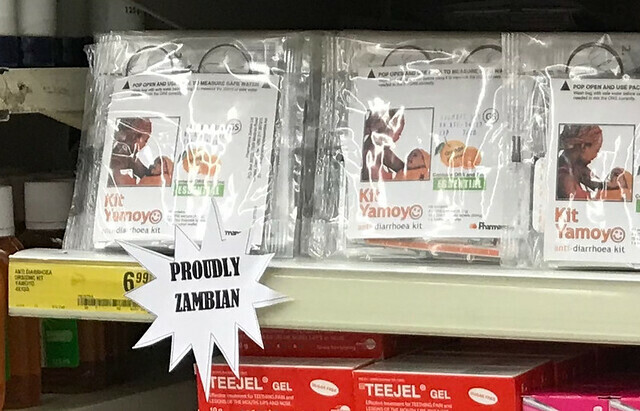 So, perhaps inevitably, some anxiety is creeping in: have we done enough over the last two years to establish Kit Yamoyo in the Zambian market and for the product to be self-sustaining without further donor support? During the scale-up phase the aim has been to launch ‘Kit Yamoyo’ as a locally produced, affordable diarrhoea treatment kit; effectively, the ‘go to’ treatment for childhood diarrhoea. In this process ColaLife has worked hard NOT to become part of the solution to the problem of access to diarrhoea treatment. This is crucially important. If we had become a permanent part of the solution – as so many aid agencies and NGOs do – then when we withdraw we would take a part of the solution with us and the solution would fail – as so many solutions do. When our input ends, we don’t want to go out with a bang, or a whimper, we don’t want anyone to notice we have gone. We are currently doing the survey work for the KYTS-ACE endline – Rohit is in Zambia now overseeing this work – and this will help answer the “have we done enough?” question. In the meantime, we have to rely on the anecdotes we see and hear. This picture is one of the most positive of these anecdotes. It would certainly indicate local ownership of the product. This was taken last Thursday (9-Nov-17) in a Shoprite store in Lusaka (Manda Hill). 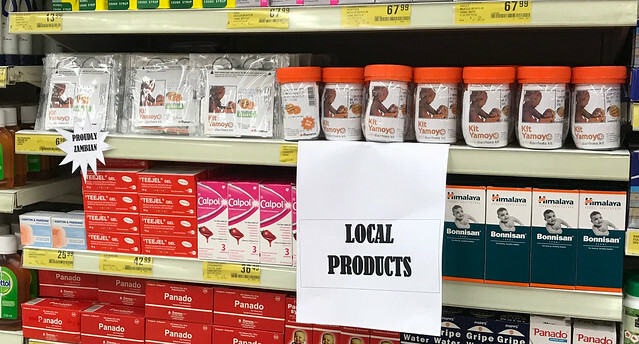 These labels were put in place by Shoprite staff as part of a promotion of local products.